We first tagged Chris the Cuckoo in spring 2011 and followed him until late summer 2015. During this time he amassed huge support from the public and became our most famous Cuckoo. He is the bird that we have been in contact with for the longest time, allowing us to study how different aspects of Cuckoo migration vary year on year. 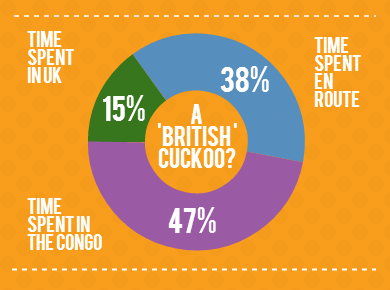 The information learnt from following Chris on his migration will help us to better understand the reasons for the decline of English Cuckoos and inform conservation. What have we learnt from Chris? "Chris has rewarded the BTO with its highest honour - important new reliable data - and has revolutionised the way we understand migration. And, if he has fallen in action then 'In some corner of a foreign desert that is for ever Cuckoo, there shall be in that gold sand a richer dust concealed'"
Same outward and return route, initially - In the first two years of the project, Chris followed the same return and outward route through Europe. After that, he switched to return via Spain, showing that a bird's migration routes can change over time. Lucky survivor / tough cookie - in 2013 Chris was the only English Cuckoo to take a more easterly route, travelling through France and Italy before crossing the desert and heading south to his wintering area in Congo. The other three all ventured down through Spain instead, perishing on the way. 2015 is the first time we have seen multiple birds die along the eastern flyway, probably due to the drought in the Po watershed, but despite this & his advancing years Chris was agonisingly close to sanctuary in the Tibesti mountains when his journey came to an end.